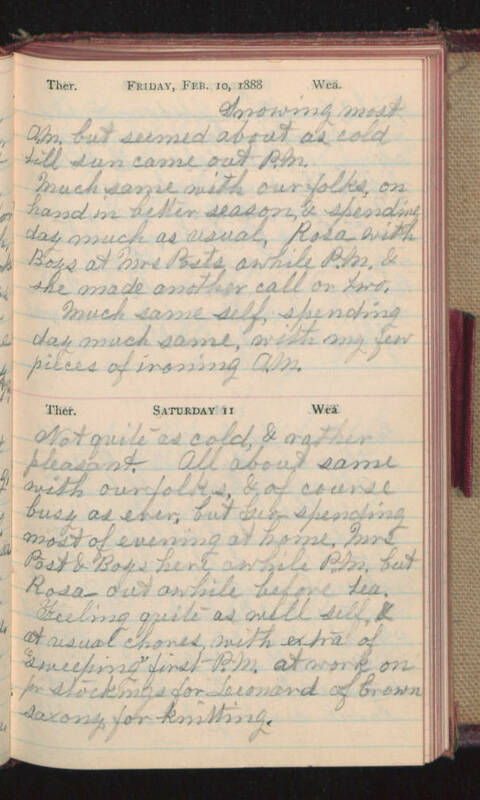 Friday, Feb. 10, 1888 Snowing most A.M. but seemed about as cold till sun came out P.M. Much same with our folks, on hand in better season, & spending day much as usual, Rosa with Boys at Mrs. Posts awhile P.M. & she made another call or two. Much same self, spending day much same, with my few pieces of incoming A.M. Saturday 11 Not quite as cold, & rather pleasant. All about same with our folks, & of course busy as ever, but Geo spending most of evening at home. Mrs. Post & Boys here awhile P.M. but Rosa out awhile before tea. Feeling quite as well self & at usual chores with extra of "sweeping" first P.M. at work on for stockings for Leonard of brown Saxony for knitting.